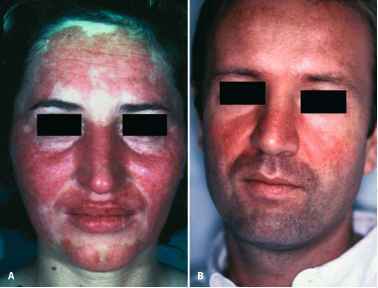 Sclerodermatous changes are an unusual feature of patients with SLE. In general, they occur in patients with SLE who possess anti-U1RNP antibodies. In addition to the sclerotic and swollen puffy hands, these patients with SLE frequently have Raynaud's phenomenon, pulmonary insufficiency, and esophageal dysmotility. Many of these patients, because of the presence of anti-U1RNP antibodies, have been described under the rubric of the mixed connective tissue syndrome (Maddison et al. 1978, Sharp et al. 1976). This is a somewhat controversial designation, and many of these patients would be described by other investigators as having SLE. In one study of 100 anti-U1RNP antibody-positive patients with mixed connective tissue disease, 66% had swollen hands, 65% of 75 patients tested demonstrated esophageal dysmotility, and 67% of 43 tested had pulmonary diffusion abnormalities (Sharp et al. 1976). Furthermore, cutaneous calcinosis is rare in SLE (Kabir and Malkinson 1969).